Samina Baig with her hero brother Mirza Ali (left) standing beside the Prime Minister of Pakistan, Nawaz Sharif. Also in the photo, Chief Minister of Gilgit-Baltistan, Mr.Syed Mehdi Shah, and his advisor, Ms. Sadia Danish. Photo: Samina Baig Facebook page. Copyright. Editor’s Introductory Remarks: On May 19, 2013, at precisely 7:40 am, Samina Baig became the first Pakistani woman to reach the peak of the world`s highest mountain, Everest, and proudly place on it the flag of Pakistan as well as that of the Ismaili Imamat, which is often referred to as ‘My Flag’ by members of the Ismaili community. She spent 10 minutes on the summit as her mentor, trainer and proud older brother, Mirza Ali Baig, watched her unique accomplishment from a few hundred metres away, not wishing to scale the peak until a later date, to give the singular honour of the summit’s ascent to his beloved sister. Voice of America’s Urdu channel carried a dispatch about Samina Baig and her brother, Mirza Ali in a news segment in 2011 after she had climbed a 6300m peak near Hunza in Northern Pakistan, which was then was named after her. Photo: Samina Baig’s Facebook page. Copyright. 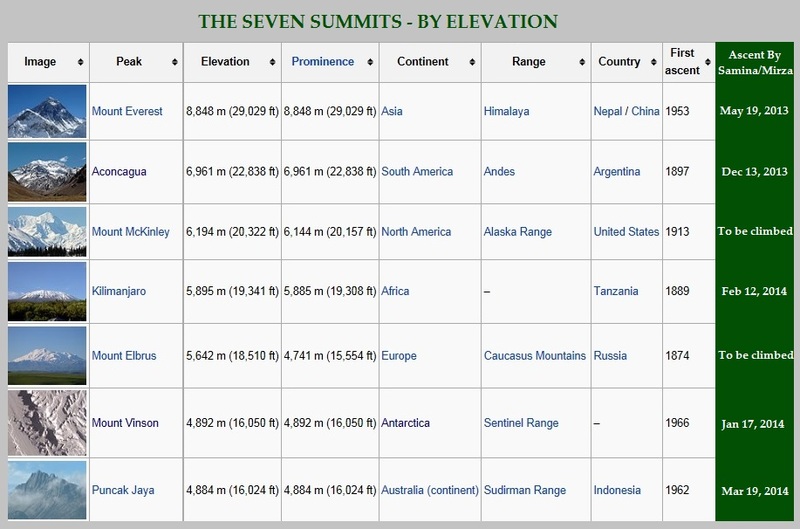 The Seven Summits are the highest mountains of each of the seven continents. Summiting all of them is regarded as a mountaineering challenge, a feat which Samina Baig and her brother Mirza Ali have undertaken to complete. Samina has reached the peaks of 5 mountains as of April 29, 2014. Please see the column in green of this image. Photo: Wikipedia (above image modified by Simerg). Click for enlargement. Since April 2013, Samina and Mirza have set the goal to reach the Seven Summits, that is to reach the top of the highest mountains in each continent. The chart above explains their mission, and their accomplishments so far. In this world exclusive interview with Simerg, Samina with her brother cover many aspects of mountain climbing including its technical aspects and risks and the incredible region of Northern Pakistan where she was born, and which is home to thousands of peaks over 5000 metres, including K2 the word’s second highest after Everest. For Samina, mountain climbing is not a fun sport, but an expression of her aspiration as a woman who can achieve the highest ambitions in life. She wants the youth of the day, especially women, to try to scale their own monumental challenges (or mountains) in life, and conquer them bravely. We hope that her insights will inform and enlighten our readers about mountaineering, and at the same time help promote Samina’s ambition for her sisters around the world to try and seek to break world records in every aspect of their lives. Samina Baig championing women’s equality and rights through this banner as well as her mountain climbing. Photo: Samina Baig’s Facebook page. Copyright. The written questions were prepared in advance by the editor of Simerg, and Samina Baig and her brother Mirza Ali provided the answers in written format. Malik Mirza facilitated Simerg’s exchange of communications with the mountaineering duo and we wish to record and acknowledge his valuable contribution. Simerg would also like to extend its gratitude to Iqbal Motani of Ottawa for his assistance in finalizing this piece as well as his constant involvement with many other articles that appear on this website. We welcome comments on this piece and invites questions for Samina and Mirza Ali in the feedback form provided at the bottom of this page. You may, alternatively, send your comment or question by email to Simerg@aol.com, subject: Mountaineers Samina Baig and Mirza Ali. Samina Baig at base camp of Everest with Bhai (brother) Mirza Ali. Photo: Samina Baig’s Facebook page. Copyright. SIMERG: For many professional marathoners running two marathons a year, or perhaps a maximum of three, is the limit. Your goal is to complete the seven summits over a span of several months rather than years. Isn’t that too ambitious or is it a common practice among mountaineers to climb one mountain every month? SAMINA/MIRZA: Well, to be honest it is not an easy project. I cannot speak for other sports but mountaineering presents numerous and unique challenges including unpredictable weather conditions. Out of say 100 mountaineers, perhaps only one may attempt seven summits in this style. We may call it “rapid” style and so far very few people have been successful. So the answer to your question is ‘No’ – such an approach is not the normal way of mountain climbing! Mirza Ali on Mt. Everest. Photo: Mirza Ali Collection. Copyright. SIMERG: You are a brother-sister duo. Who looks after whom and who worries more? SAMINA/MIRZA: We look after each other most of the time, but being a brother I am responsible for looking after my sister – the brother has to carry more responsibilities! SIMERG: How do you help and support each other both before and during the climb? Is it more of a physical preparation or a mental preparation, or both? SAMINA/MIRZA: It is more mental preparation but of course there is physical preparation also. Most of the time we study the mountain and its physical conditions, then we plan our climb accordingly. We prepare ourselves mentally for the situation we would be going through and when mentally strong, we work out physically to prepare for physical challenges. Being the expert on mountains, I always provide advice and recommendations to Samina on various issues – for instance, she has difficulties adjusting to different food from different countries and this is one area where I help her out! Samina Baig on the ‘hard blue-iced’ Lhotse Face of Mt. Everest. Photo: Mirza Ali. Copyright. SIMERG: What worries you the most before you undertake a climb? Say for Mt. Everest, how many days of preparation were necessary. When did you get to the base camp and when did you actually start your climb? SAMINA/MIRZA: Most of the time, it is the weather that worries us the most. If the weather is not favourable we can’t proceed. Then there is the personal physical conditions and wellness that matter. The third thing is logistics — there has to be proper arrangement and management for a large group. Everything has to come together perfectly for a safe climb as mountains present many risks. The entire Everest expedition involved 3 years of continued preparation for various situations. It took us eight days to reach the Mt. Everest base camp on 9th April, 2013, and then after few acclimatization hikes, our climb started on 20th April! A spectacular photo of the Rakaposhi peak (7,788 m) from the summit of Mount Diran (7,266-metre), both in the Karakoram range surrounding Gilgit-Balistan in Northern Pakistan. Photo: Samina Baig. Copyright. SIMERG: Shimshal — the region where you were raised — was inaccessible by motor road until about ten years ago. Has that contributed to making the Shimshali Ismailis physically fit and great mountain climbers? SAMINA/MIRZA: We say that we [Shimshalis] are born mountaineers. But that situation has changed; life is not as hard now as before. People are still basically strong because of birth at high altitude but routine life has changed and younger generation have less hardship now compared to a decade back! SIMERG: Is mountain climbing natural to you and everyone else living in Shimshal or is it a skill that has to be learnt, refined and enhanced? SAMINA/MIRZA: Well, because of the natural environment being in the mountains, it is common for people in Shimshal to be strong and have the physical as well mental capability to overcome the hardship of the mountains and harsh weather. However, being in the mountains is not enough, you have to learn the necessary skills and techniques to climb mountains and when it come to using modern equipment, that requires lots of training as well. SIMERG: Is mountaineering a fading sport in Shimshal or are the youth still excited about going on expeditions? There is less technical skills about mountaineering. Thus there has been a shift with foreign expeditions hiring more Sherpas from Nepal than locals from here. However, I am working to train more youth from the village where they didn’t go to school, and promote mountain adventure as a sport among these youth, men and women alike. SIMERG: Tell us something about the mountains around the Northern Areas of Pakistan. How did they prepare you to undertake the Everest journey? SAMINA/MIRZA: Pakistan and specially Giligit-Baltistan is surrounded by thousands of mountains. Ranging from 3000 metres (m) to 88611m, Gilgit-Baltistan is home of five 8000m mountains out of 14 in the world, there are 42 mountains above 7500m, 120 peaks above 7000m, and the number of peaks above 6000m is around 700 plus, and there are countless 5000m! This is an incredible and fascinating mountain country. The area has the greatest adventure potential and the mountains we have in Pakistan in Gilgit-Baltistan cannot be found anywhere in the world. K2 at 8611m is the world’s second tallest peak and the mountains, the passes and glaciers in Gilgit-Baltistan are just spectacular! Shimshal valley in winter. Photo: Wikipedia. And yes, to return to your question, being from Shimshal, which is 3300m above sea level, did help us a lot to prepare for Mt. Everest — being born at high altitude and then growing up there were plus points for us. While adjusting in the high altitude and with lots of opportunities for training, the area gave us enormous support. It was not a big deal to travel long ways for the training. So, yes it was a definite advantage in being from the mountains. SIMERG: What is the most different aspect about climbing Everest -– the fact that it is the highest mountain? SAMINA/MIRZA: Yes, indeed. Out of 7 billion people in the world, there are thousands of people who have this great wish to reach to the top of the world and that is their life time goal — the achievement of reaching to the top of earth’s highest point by walking. Thus, this is something very unique about Mt. Everest and reaching its top, being the first woman from a country -– that was very unique too! SIMERG: It is often said that Shimshalis are to Pakistan as Sherpas are to Nepal. More than twenty well-known mountaineers from this valley have made Pakistan proud in the field of tourism. Some people call it The Valley of Mountaineers. Tell us something about the outstanding mountaineers around Shimshal and the Northern Areas of Pakistan who inspired you. SAMINA/MIRZA: It’s very true that Shimshal produced some of the most respected mountain climbers, and the valley contributed greatly to the tourism industry while helping foreign expeditions reaching the summits of various peaks in Pakistan. Some of the great mountaineers from Shimshal are Mr. Rajab Shah who is also the first Pakistani to climb all five 8000m peaks. Mr. Mehruban Shah, Mr. Yousuf Khan, Mr. Muhammad Ullah, Mr. Qurban Muhammad, Mr. Qudrat Ali & Mr. Shaheen Baig had the honor to launch the first Pakistani expedition to K2. Mr. Ali Mussa, Hasil Shah, Mr. Amin Ullah Baig are other notable names. These people have climbed at least three 8000m peaks in Pakistan. Yes, and my uncles, Mr. Yousuf Khan and Muhammad Ullah inspired me to climb mountains since they climbed for the Pakistani Army. But I changed the traditional way of climbing by just assisting foreign expeditions to be independent climbers and promote it as a sport as well rather than just consider it as a means of livelihood. A spectacular photo of the world’s 2nd highest mountain – and arguably the most dangerous to climb – the K2 (8,611 m or 28,251 ft) in the Gilgit-Balistan region of Northern Pakistan. Photo: Wikipedia. SIMERG: Is Everest being the highest mountain in the world, also the most difficult to climb? If not, which in your opinion was more difficult. SAMINA/MIRZA: I think Everest is a dangerous mountain and it presents technical difficulties, and many people die on the mountain every year — it has a death toll of about 10% yearly. But because of sufficient manpower on the mountain, the difficulties are minimized by the supply of gears and the fixing of ropes. Thus, owing to the extra manpower on the mountain it makes Everest easier than other mountains in that sense, where human assistance and power can be much less. When it comes to technical difficulties then K2, the second tallest mountain on earth, is more difficult because most of the job gets done by the climbers. The second extremely challenging factor is the weather — Karakorum has unpredictable weather. But if similar manpower was employed on K2, as is on Everest, than it would be easier to climb K2 since you can gain altitude more quickly on K2 compared to Everest. Samina Baig on the west ridge of K2, the world’s second highest mountain, and arguably the most difficult to climb. Photo: Samina Baig’s Facebook page. Copyright. SIMERG: Were you concerned or did you encounter waste dumped by other climbers along the way on Everest? Is the environment clean? SAMINA/MIRZA: I wouldn’t say other climbers are a problem. It is, I would say, more the responsibility of local Sherpas who are employed and also paid to keep the mountain clean. Most of the climbers don’t throw all their waste, since the Sherpas cook for the climbers and they are the ones who handle the trash. I have seen Sherpas who leave the empty bottle oxygen and shredded tents. Lots of dumped shredded tents and used oxygen bottles can be found at almost 8000m of the Everest’s South Col.
SIMERG: Give us an idea of the equipment you had with you when you reached the top of Everest? Oxygen masks as well? SAMINA/MIRZA: Yes, for high altitude climbing we do have different equipment and clothing including down suit which is warm and made of goose down, mittens, balaclava, warm caps. To protect from extreme cold and wind-chill, you need snow goggles, crampons, climbing shoes which is purely made for high altitude climbing. And of course supplemental bottle oxygen. When we were going to the summit we did use supplement oxygen. Samina Baig after touching Camp III (7000m) through the Khambu Ice fall, while coming back to base camp at Mt. Everest. Photo: Samina Baig’s Facebook page. Copyright. SIMERG: Mawlana Hazar Imam’s executive jet plane carries his red-green flag on the wing panel along with the Imamat crest. It probably climbs well above Mount Everest. But tell us, how did you feel when you placed the Ismaili Imamat flag on the summit? Does the flag remain there or did you bring it back? SAMINA/MIRZA: Well, it is once in a life time to have this luck to unfurl our Ismaili flag on top of the earth by walking and reaching there at 29,000 ft plus. And when it comes to being the first Pakistani woman and the first Ismaili woman to put the nation’s flag and the Ismaili Imamat red and green flag on top of the world, one cannot adequately express the feeling. It is indeed a BLESSING of a life time! We did bring the flag back, and with all love and respect, sent it to Sarcar Mawlana Hazar Imam. SIMERG: How were you honoured in your own town or village and how did the Ismaili community in Pakistan respond to your achievement? SAMINA/MIRZA: I think the love and recognition we received in Pakistan and from the Jamat was indeed incredible and overwhelming. The reception at Serena hotel on our arrival from Everest was simply amazing. The President of the Aga Khan National Council for Pakistan, Mr. Iqbal Walji, the President of the Aga Khan University, Mr. Firoz Rasul, and the Chairman of the Aga Khan Youth & Sports Board for Pakistan, Mr. Aziz Shariff, were all present at the reception. Their presence and recognition made the event more special, and we truly felt so much blessed to be honoured in that way. Samina and Mirza Ali recognized by Ismaili leaders in Pakistan. The reception in Gilgit, and specially in our home town in Hunza, Upper Hunza, was truly remarkable. We would say it was more than what we deserved. These moments are very close to our heart and the way the jamat in Gilgit-Baltistan and particularly the Council in Hunza recognized our achievement is unmatchable! SIMERG: I read that you have a great mountaineering school in Shimshal — it is among the best in the world. Who runs it? Do you get Ismailis from other parts of Pakistan or the Western World come to learn mountaineering skills in your school or are the students mainly westerners? SAMINA/MIRZA: Shimshal mountaineering school is a great initiative by an Italian mountaineer Simone Moro who funded it, and Mr. Qudart and Shaheen collaborated with him to get this school going. Some of the training has been conducted by some western climbers, local people, including women, but a lot work is still needed to make it a better place to produce skillful mountaineers. Since I didn’t get a chance to visit the school to attend any training camp, I don’t know much about the details of the training. I believe the school needs to send some of the trainers to international schools of Mountain Guiding to meet International Standards. SIMERG: Is mountain climbing common among women of Shimshal? SAMINA/MIRZA: As I mentioned, Shimshalis are born mountaineers. And if you go back a few years several women have attempted mountains, apart from going in the mountains to collect wood or graze cattle. It was the Golden Jubilee occasion when some girls climbed a 5000m peak and eight girls last year attempted three 6000m peaks. I believe the Aga Khan Sports Board Shimshal also had an expedition for old age women and they climbed a 5900m peak! So all Shimshalis, both boys and girls are born mountaineers! SIMERG: Samina — would your brother always accompany you on a very challenging mountain climb — and would you venture with another girl mountaineer and leave your brother behind? Samina Baig and her brother Mirza Ali at the summit of Mt. Vinson in Antartica on January 17, 2014. Photo: Samina Baig’s Facebook page. Copyright. SAMINA/MIRZA: I think for me climbing is not just a fun thing. I do climbing with my brother for a reason and for awareness and education purposes. I might have not taken mountain climbing if it was merely for fun or pleasure. The reason behind our climbing is to underscore and promote gender equality and women empowerment and the main part of it is to promote this as a sport in Pakistan. Once we are done with our main cause to climb mountains for gender equality and women empowerment, I will for sure climb with other girls as well! SIMERG: How long did it take you to climb Mt. Everest? Describe the most dangerous part of your journey? Did you at any time feel scared? SAMINA/MIRZA: It took 2 months to climb Mt. Everest including travel time. We spent 42 days at the base camp at 5300m. We slept in tents for this long and ate in the tents. The most dangerous part is going through the Khambu ice fall, crossing huge crevices and escaping hanging ice. I felt scared going through these lose hanging ice chunks. The second dangerous part was climbing through Lhotse face, which is hard blue ice and steep! A minor mistake in clipping your carabinar may be fatal. Samina Baig and Mirza Ali on Mt. Everest. Photo: Mirza Ali. Copyright. SIMERG: Did the weather affect you in any way or was it cooperative? SAMINA/MIRZA: The first time we were going to Camp, heavy snow started falling and we were 200m short from reaching camp, and we were forced to turn around. The weather was not nice at all. When we were at camp IV at 7900m the weather turned really bad in the evening but that was for a short time; then we had wonderful weather! SIMERG: Was all your climbing done during the day time? SAMINA/MIRZA: Not necessarily during the day most of the time! We started at midnight and continued to climb till 11pm to avoid avalanche, rock falls and so on. Sometimes we started midnight and ended the following midnight. Likewise, when we were going to the summit we started at 8pm and ended back to camp II at 8pm — this means 24 hours of non-stop climbing, getting to the summit from Camp IV and going back all the way down to camp II! SIMERG: Once you get to the peak, how much time do you spend there? Was the view clear when you reached the peak? SAMINA/MIRZA: We don’t spend too much time on the summit since weather can, at any time, become a problem and the wind can blow you away. I spent only ten minutes on the summit taking photos with the Ismaili and Pakistan flags and then rushed down. The view was amazing and very clear! SIMERG: Is the descent straightforward or are there stages during the descent that can be as nearly as challenging as the ascent? SAMINA/MIRZA: Descending can be more difficult than ascending, as going to the summit can be exhausting due to the thin air, and with less energy it is not easy to go down. There are stages on the way down, but all depends on your energy level at each stage. Some people stay at camp IV after the summit, some go down to camp III while those who have super energy, they can go to camp II. SIMERG: How cold was it climbing Mount Vinson in Antarctica compared to Everest? I read that the mountain’s isolation, combined with the extreme cold and unpredictable weather on the continent, makes Vinson a very serious undertaking and that even a small accident there can be disastrous. SAMINA/MIRZA: Well, we can’t degrade or compare mountains. Every mountain has its own challenge, weather-wise and physically. Mt. Vinson is in a frozen continent where everywhere there is ice and snow and it is very very cold even when there is the sun. Cold, minor clouds, and wind all present their own challenges, especially with wind and temperatures as low as -35 to -40. We had good experience of Mt. Vinson where the weather was good for the first three days with little wind and when it was not that cold. But the going to Camp 1 and then to camp II was not easy at all – the wind was hard and strong and the temperature fell rapidly. The wind was actually knocking down Samina while climbing on the fixed line. We climbed for 8 hours, almost 1100m, and that was very difficult. Samina and Mirza Ali at summit of South America’s highest mountain in Argentina, Mt. Aconcagua, on December 13, 2013. SIMERG: Your first trip to South America involved the climbing of Mt. Aconcagua – the highest in the continent. Give us some idea about that mountain and what gave you the greatest thrill? SAMINA/MIRZA: Our Adventure Diplomacy project of “7 summits 7 continents” was South America’s Mt. Aconcagu. As mentioned earlier, every mountain has its physical and weather-wise difficulties. Mt. Aconcagua is also well-known for its unpredictable weather owing to it being the solo in the Andes range. The mountain is very windy and cold, though the route we did — the polish traverse — was not technical physically but it was difficult weather-wise and the summit day and the last three hours of the climb was horrible. It snowed continuously, and was windy all the way to the summit, as well as going down to camp III. The thrilling and most dangerous moments were when we climbed down the mountain as we could barely see ahead — one metre at the most, because of strong wind and snow storm. But By the Grace of Almighty, we made it. Without His blessings we would not have succeeded. SIMERG: On any of these mountains, have you seen extra-ordinary wildlife? SAMINA/MIRZA: We didn’t see any extra ordinary wildlife while climbing Aconcagua and Mt. Vinson, though after Vinson, the wildlife in Torres del Paine in the Chilean Patagonia was amazing! Samina Baidg and Mirza Ali at Uhuru Peak (5895m), the summit of Mt. Kilimanjaro in Tanzania, Africa’s highest mountain, on February 12, 2014. Photo: Samina Baig’s Facebook page. Copyright. SIMERG: Your next mountain, in 2014, was Mt. Kilimanjaro in Tanzania and there is a general perception that any physically fit person can easily walk up Kilimanjaro. Why waste time on climbing that mountain, especially for mountaineers of your caliber. Did you take the climb seriously as you would for other mountains? SAMINA/MIRZA: Well, Kilimanjaro is said to be ‘a walk in the park’ but as I said, weather can turn any thing into hell. We did experience on Kilimanjaro one of the tougher expeditions of our climbs — the weather was rough, it rained for two days and nights. Then, when we went for the summit at midnight the wind was very strong and the snow was falling heavily. The storm made the climb very difficult. Lots of people turned around due to bad weather but we made it. Shukran Alhamdullilah! SIMERG: What about Catsentsz in Indonesia? SAMINA/MIRZA: Carstensz pyramid was not easy either because it is a tough trek to the peak through mud, in rain and jungles. SIMERG: You are away from home for long periods. How do you stay in touch with your family and friends? Has the internet, the social media and blogging facilitated that constant communication with your families and friends? SAMINA/MIRZA: It is always difficult to communicate with family and friends when in the mountains. In the Himalayas we have a satellite phone, Thuraya, which connects us but when we were in South America and Antarctica this service was not available and we couldn’t communicate with our family for two weeks each time, but we were able to speak from the summit using the iridium service instead of Thuraya. But when in cities with internet connectivity, social media works well for us. SIMERG: As part of your mountain climbing training, did you use porters? Samina Baig and Mirza Ali experienced some rare moments of luxury as they travelled in this beautiful coach from Mendoza to Buenos Aires during their journey to Argentina to climb Mt. Aconcagua on December 13, 2013. Photo: Samina Baig’s Facebook page. Copyright. SAMINA/MIRZA: During our training, we did have porters with us and we had Sherpas on Mt. Everest, but in South America and Antarctica you have to carry your own gears, and pitch your own tents. SIMERG: Who accompanies you as porters, for example at Everest. Were they Sherpas from Nepal. Do they accompany you all the way to the top? SAMINA/MIRZA: We climbed with the Seven Summits Treks and we had one to one sherpa. Yes, the Sherpas reached the summit with me, even Mirza Bhai sent his Sherpa with me to get to the summit as he wanted me to reach the peak by myself. He watched me from a close distance! SIMERG: Is the climbing that you do self-supporting or do you get funding from numerous sources? SAMINA/MIRZA: Well, we did get funding for our expeditions from our foreign friends and philanthropists. Our Mt. Everest expedition was funded by our friends from New Zeeland — Joy Deerness, Arthur Smith and Jenifer Kent. This was the time when nobody would listen to me or believe me or my work! Our Mt. Aconcagua and Mt. Vinson was sponsored by a very generous philanthropist, and our Mt. Mickenly expedition in Alaska is going to be sponsored by another philanthropist, Ms. Diana McArthur. The other peaks were again sponsored by the same friends from New Zealand! Samina Baig and and Mirza Ali at summit of Indonesia’s Mt. Puncak Jaya (4884m), also known as Carstensz Pyramid, the highest mountain in the continent of Australia. They reached the summit on March 19, 2014. Photo: Samina Baig Facebook page. SIMERG: Have you ever been on an expedition to climb a mountain and returned without climbing it? For what reason did you not climb it? Was the weather a factor? Were there avalanches? SAMINA/MIRZA: Fortunately, there were no such incidents so as to not attempt the peak, we did attempt peaks but there were moments when we didn’t make it to the summit, and the main factor on the mountain is bad weather. I abandoned my Mt. Manslu 8163m summit bid because of a massive avalanche which killed 11 people and injured 16 people. So, certain situations may force you to abandon your summit push. Most of the time it’s attributable to weather. Samina Baig and Mirza Ali pictured with Nazir Sabir (right) in Nepal. Photo: Samina Baig Facebook page. Copyright. SIMERG: Getting to the top of which one mountain has brought you the greatest amount of satisfaction and happiness, and why? SAMINA/MIRZA: Reaching every summit is a great feeling, either your first summit, or the most difficult summit, or the summit of the highest mountain gives you the great pleasure. And you feel more satisfied and happy when you know that reaching a summit has a purpose behind it. I must say that the greatest feeling was reaching the summit of Mt. Everest, where history was made in Pakistan and in the Ismaili jamat. Being the first woman from Pakistan and the first Ismaili to climb it was just out of this world, and along with that, the significance of reaching that summit for gender equality and specially women empowerment was simply incredible — one can’t describe the feeling in words. SIMERG: What is your advice to would be mountaineers? Would you recommend the Ismaili youth to take up mountaineering as a hobby. SAMINA/MIRZA: Our advice is to not only climb mountains. Our main mission and message to the youth and women of areas that are ignored and deprived is that one should not stop trying to reach the peak in every walk of life. Every one has their own mountains to surmount, either in education, in professional life or in other sports. One should do his or her best to excel in his or her field of work and reach the highest possible levels of standards of excellence and quality. And let me say to my fellow male brothers that when both Mirza and myself — as brother and sister — climb together without gender discrimination, others can do similarly in their field of work and make their family, jamat and the nation proud! My advice for mountaineering and outdoor is that one should be very strong in the head and ready to face physical hardships, such as cold, hunger, thirst and danger! Then work out to physically to overcome the challenges. Outdoor and mountain adventure refresh the brain and encourage you to do positive things. It is also a source where one can understand one’s strength and weaknesses and face the extreme challenges. At the top – Samina Baig on Mount Everest with the flag of Pakistan. Photo: Samina Baig collection. Copyright. SIMERG: Thank you for this extremely unique and wonderful opportunity to interview you. We look forward to seeing you in Canada and the USA in the near fture. Any final thoughts? SAMINA/MIRZA: It is our pleasure to participate in this interview, which has allowed us to speak of mountaineering and the challenges that go with it. Our final thought and advice about mountaineering to all Ismaili youth is to come in to this sport because our beloved Hazar Imam himself was a great skier, and won several awards and participated in the Winter Olympics! So this is a healthy sport indeed, and when our Imam likes the sport, definitely we can go for it too! Date posted: Tuesday, April 29, 2014. YOUR FEEDBACK AND QUESTIONS: Please fill out the feedback form below or send an email to simerg@aol.com with your comment, feedback or questions for Samina Baig and Mirza Ali. Share this article with others via the share option below. Please visit the Simerg Home page for links to articles posted most recently. For links to articles posted on this Web site since its launch in March 2009, please click Table of Contents. Sign-up for blog subscription at top right of this page. We welcome feedback/letters from our readers on this exclusive interview. Please use the LEAVE A REPLY box which appears below or send an email to Simerg@aol.com, Subject: Samina Baig Interview. Your feedback may be edited for length and brevity, and is subject to moderation. We are unable to acknowledge unpublished letters. Thanks Mirza Ali and Samina for your endeavours and successfully climbing seven peaks. The whole mountainous community is proud of you being ismaili. Thanks to Malik Merchant for making available this brilliant interview. Where there is a will there is a way; brave Samina, well done. A remarkable achievement! Congratulations to Samina and Mirza. You know someone has helped! All the best for more family unity and successful adventures. Wow! That’s tremendous Samina and Mirza your team of brother and sister has done wonders, of course, the editor to enable us to get the details via his superb website http://www.simerg.com a MUST for all, young and old, Ismailis and any living beings on this earth! In my youth I had managed to climb Jackson Summit of Mt Elgon some 14,000 ft my first climbing experience. Some of the boys in H H Aga Khan Secondary School reached the highest, Wagagi peak of Mt Elgon. I was invited to join in by the Head Master Mr J McCourt, even though I was merely a Primary School teacher. His justification was that I was nearer the age of girls at his School so a link between his staff and pupils. One needs a ‘sathi’ or companion or a ‘toli’ a group to share this venture. A truly amazing feat, and best wishes in your future endeavours of making it to the remaining “seven summits” in due course. Mirza was very considerate in what he did by letting Samina reach the top of Everest by herself. Hope he can ascend the mountain in the very near future, following this year’s tragic event and the cancellation of the climbing calendar. Bravo and congratulations. You are an inspiration to everyone. Sultan and Rosila Jessa in Montreal. Congratulations. … where there is a will, there is a way… with best wishes…..
Congratulations to the Baig family. And thank you Simerg for another excellent article. Well done! A brave and beautiful brother and sister team. The responses to the very appropriate questions were extremely informative. It is a team that will continue to do the whole community proud. I enjoyed this interview very much. It’s remarkable how well they speak. I take it it was in English, but we ought to be told. We ought to be told where the interview was done, how long it took, what do they normally wear. I couldn’t make out who spoke when in SAMINA/MIRZA. Samina spoke so well in the first answer. The interview should have also brought out their everyday life – their education, family, their normal interests apart from climbing mountains. Still, congratulations to Simerg on a brilliant interview and to Samina and Mirza on their achievements so far and my prayers they accomplish the rest of their goals. Thank you for your feedback Vali. As noted, the interview was conducted through written questions and answers. I leave the readers to submit questions for Samina and her brother, and I am sure they will reply in due course.